Hello. 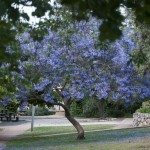 I have a jacaranda tree which has grown straight up to about 4 metres and only has two vertical branches straight up, the v starts about halfway up the tree.we have had to stake it up as it sways alot in the wind. Im wondering if I should cut the top out of the tree and if I prune it would it promote more branches to grow furtherdown thetrunk and do you advise pruning it above or below the v in the 2 vertical branches. Any extra advise would be greatly appreciated. Thanks verymuch.